Lamborghini Urus SUV by the Italian carmaker has been launched in India at Price of Rs 3 crore.The Lamborghini Urus is Mainly based on the MLB EVo platform which we already has been seen on Bentley Bentayga, Porsche Cayenne and Audi Q7.Lamborghini Urus having supercar like superb performance while this car also maintaining the all functionality of a Premium SUV. Engine : Lamborghini Urus having 4.0-litre twin turbo V8 engine with a displacement of 3,996cc. The engine is capable to produce max power of 650hp @ 6000rpm and max torque of 850Nm @ 2250-4500rpm. This Beast Comes with permanent four-wheel drive system and eight-speed automatic transmission.Additionaly permanent four-wheel drive system with active torque vectoring and rear-wheel steering system makes this beast more powerful. 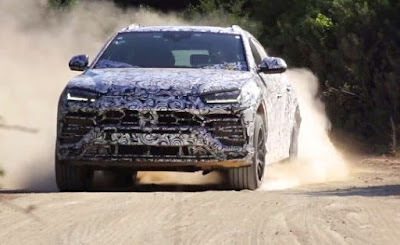 Top Speed : Weight of car is 2.2 tonnes ,but Due to powerful turbo V8 motor, the Lamborghini Urus can reach a top speed of 305km/h very easy.The Lamborghini Urus can reach 0-100km/h in 3.6 seconds and 0-200km/h in 12.8 seconds. Features : Urus comes with So Many driving modes For Superb Driving Experience.These are Strada, Sports, and Ursa and Neve, Terra, Sabbia for Some Adventurous off-road conditions, also you can customize your own Ego mode.